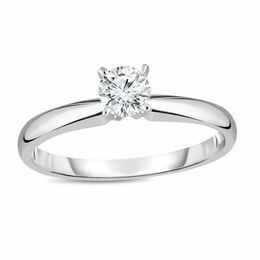 Diamonds are the most popular stone for engagement rings, but you don’t have to fit that mold. If you want to be unique or possibly use color, some other options include rubies, emeralds, opals, amethysts, citrines, garnets, and sapphires. If you wanted to go traditional, a diamond quality is determined by the five C’s. This means the clarity, carat, color, cut and cost. Clarity references how much you can see the diamond’s imperfections. Carat is how large the stone is. Color is the hue given to the diamond; this could be the traditional white or even pink, blue, or yellow. However, if your white diamond has some yellowness, that lowers the value. Cut is how deeply cut the diamond goes. The depth determines how much light goes through the diamond. Finally, the last C represents what the diamond, or ring all together is going to cost you. Now, the fun part is to choose the shape of your stone. Below are some of the most popular shapes, but there are other, more unique ones out there. This would mean the setting which the stone is placed in. Usually it is prongs. You can choose how many and how thick of prongs you want to hold your stone. Other popular choices are halo and bezel which are both an oval shaped setting. The bezel is just one stone, while the halo has stones surrounding the main stone. The most popular metals for rings are white gold, yellow gold, rose gold, and platinum. You should choose one to math your personal style and the other colored jewelry you like to wear. If you wear more silver jewelry, go for the white gold or platinum. Do you prefer gold? Choose the yellow gold. If you don’t wear a lot of other jewelry or want to be more unique, rose gold could be your best option. Hopefully this guide gave you a look inside of what you might be looking for in your ring! Good luck and congratulations! It’s going to be stunning no matter what you pick. What kind of ring are your/did you choose? Leave a comment and let us know.